Everywhere we go, it’s “eyes wide open!” We are always on the lookout for something different, something off-the-beaten path, something you won’t find (at least not easily) online. Saskatoon didn’t disappoint. You will find these two colourful birdhouses outside of JR's birdhouse workshop at the corner of Spadina Cr. and 20th St. E.
The Stumped Productions workshop on the UofS campus was a fun even if somewhat gory surprise. On our first evening, we were invited to a friends’ house for dinner where we enjoyed a great evening, highlighted by their quirky art collection and great backyard. Yes, the one with the amazing pavilion! But what impressed us most were the Picasso-inspired birdhouses. We had to have one. Well, maybe two. Turns out we could – and did. And so can you! They are made by John Remai (if the surname sounds familiar, it could be because his brother’s wife donated big bucks for Saskatoon’s controversial new Remai Art Museum, but that is another story) and he makes them in his parking garage studio in the downtown Saskatoon riverside residential tower where he lives. John Remai's (JR to his friends) garage/workshop. Once a builder always a builder? Remai, now in his ‘80s, was one Saskatoon’s biggest developers before retiring a few years ago. As a philanthropist, Remai has been a big supporter of various Saskatoon charities, as well as the local Children’s Hospital. However, he wanted to not only make personal donations but help encourage others to also give back to their community. 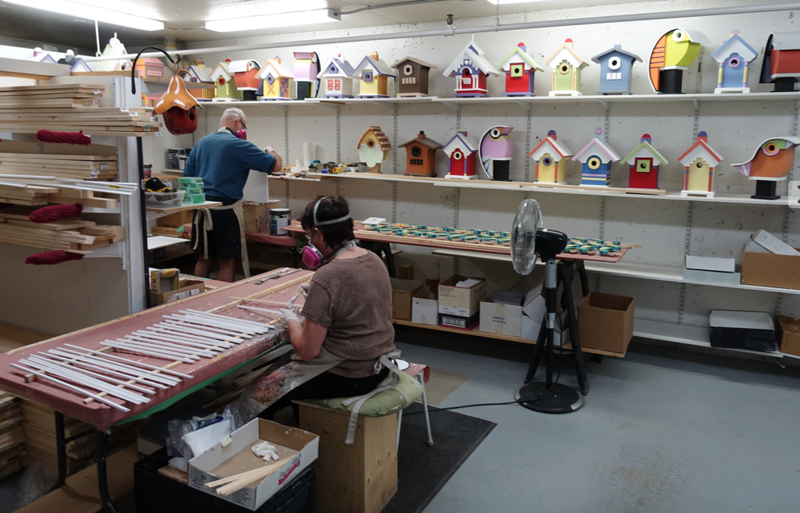 As a result, he decided in retirement to design and build birdhouses to sell to the public with all proceeds going to the Saskatoon’s Children’s Hospital. Who could resist buying one or perhaps four (our host now has four) birdhouses, three at home and one at work? The public can buy a Remai birdhouse Monday through Thursday in the basement of the office building at the corner of Spadina and 20thStreet. Depending on design, the birdhouses sell for $75 to $100, which is great value given the craftsmanship and complexity of designs. Given we were in town on a weekend, we were fortunate our host knew Remai and was able to arrange a downtown studio visit to see the birdhouses actually being built and meet Mr. Remai, a very cordial host and unassuming gentleman. 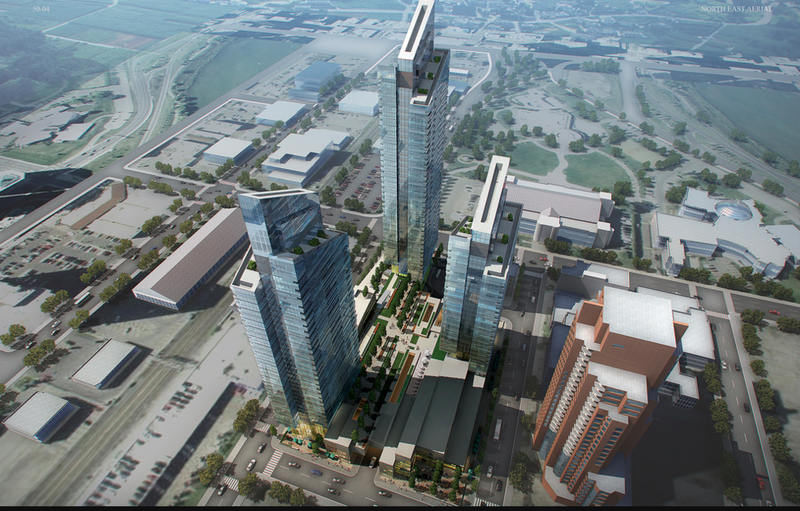 Indeed, the Remai’s huge workshop (probably the size of quadruple car garage) is located in the underground parkade of a residential tower. It is neatly divided up into three spaces, one with all the While we were there, two volunteers from the building were painting pieces of his latest design, a “parrot birdhouse” in preparation for assembly. A lovely sense of order and calmness filled this windowless, grotto-like studio. Here are some photos, which I hope will convey the scale of the operations and the diversity of the birdhouses being produced. JR with three of his most popular birdhouses. Volunteers from the building help JR with the painting and assembling. Note other birdhouse designs on the shelves in the background. The Assante building is where you can get your own birdhouse. 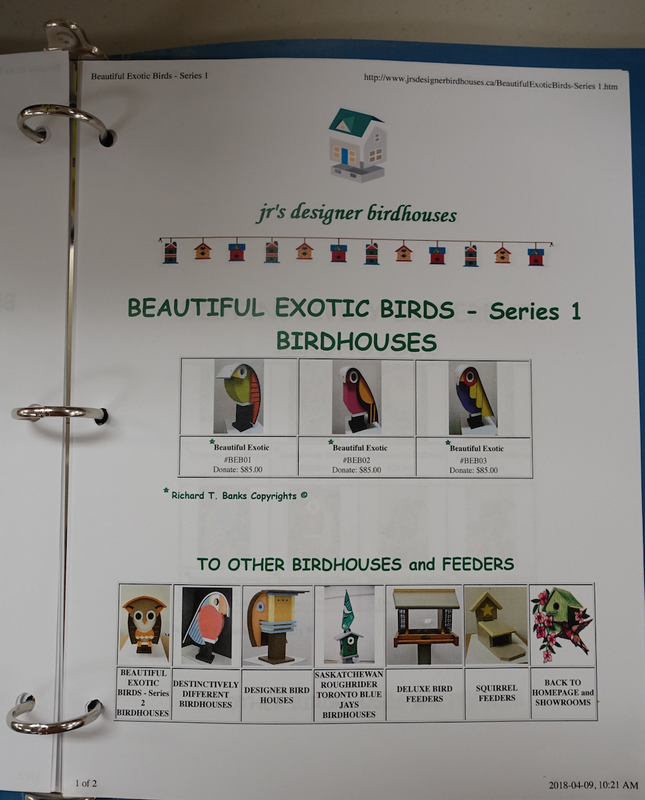 JR has a binder with the different birdhouses and other items for sale. The Douglas Cardinal designed Gordon Oakes-Red Bear Student Centre is just one of many new buildings that are synergistic to the older buildings on campus. 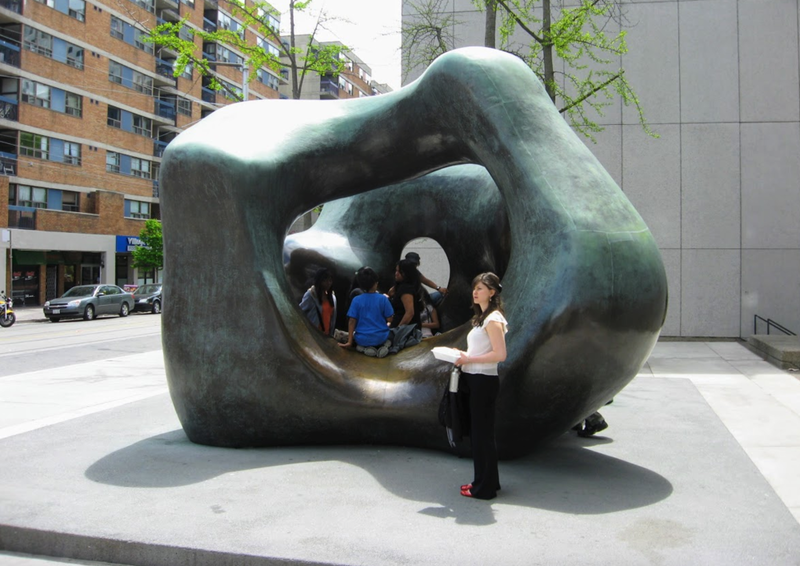 Whenever we are in a new city we make a point of exploring the postsecondary campuses. 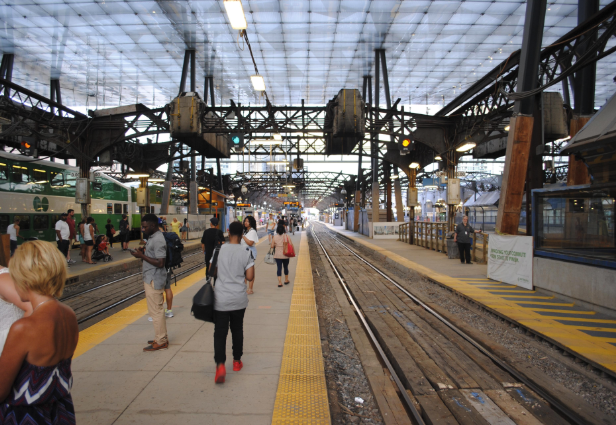 They are often full of interesting, under-the-radar places. The University of Saskatchewan (U of S) is no exception as it is home to an Antiquities Museum, a Natural History Museum and three art galleries. The campus is an architectural gem as the facades of almost all of the buildings have been built with sandstone or Tyndall stone facades giving it a timeless quality I have not experienced anywhere else. From a design perspective, it may well be the best campus in Canada! The Bowl is the heart of the campus. The U of S, like most campuses, is a maze of seemingly randomly placed buildings. 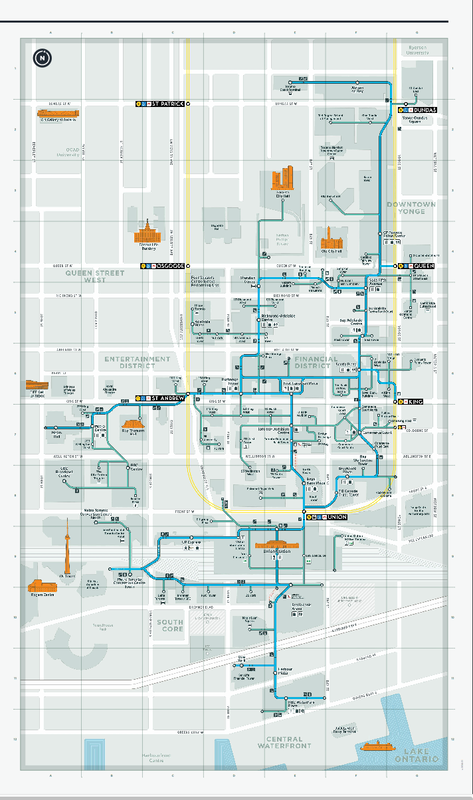 Note: I often wonder why postsecondary campuses never used the grid street system, which is so much easier to navigate. The grid street design has been around since before Christ for heaven’s sake, you’d think one or more universities would have used it. However, the good thing about the maze system is you often get lost and in doing so, you see things you might not have if you knew where you were going. 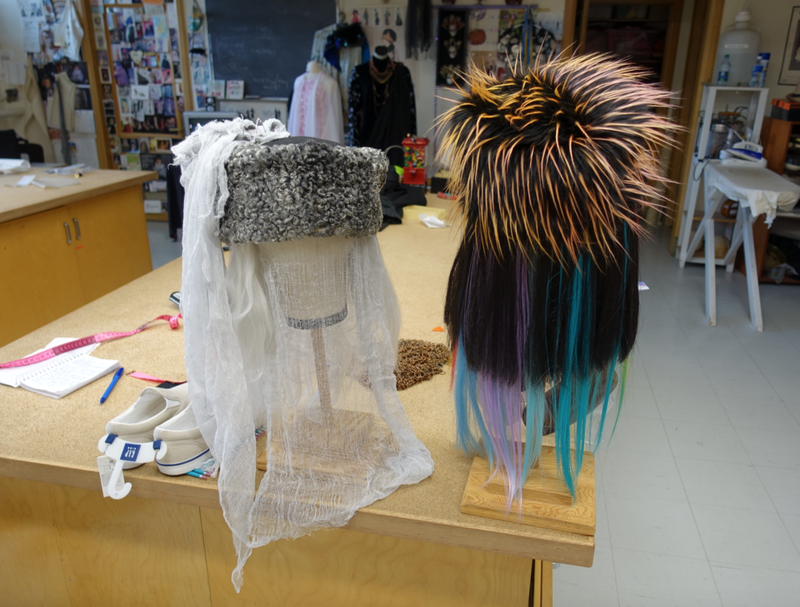 For us, getting lost lead to finding artisans making puppets for this summer’s Shakespeare on the Saskatchewan (River). The U of S a-mazing campus is huge at almost 3,000 acres or 12 square kilometres. It is home to 25,000 students. While trying to find our bearings, we noticed some quirky-looking objects in the basement windows of a building we had no intention of going into. However, they became the impetus for us to head in. 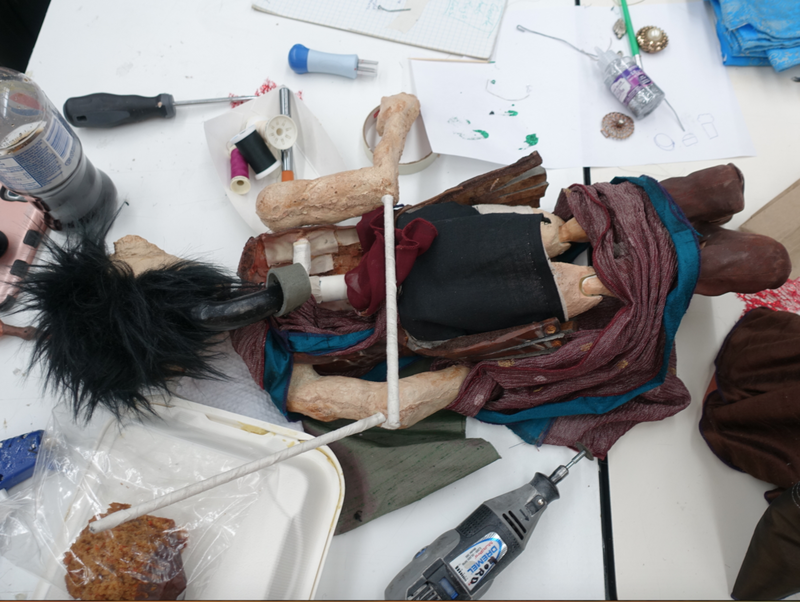 Once inside, we immediately peeked into a large studio with three people working away making puppets. We were invited in come in dozens of puppets at various stages of completion. 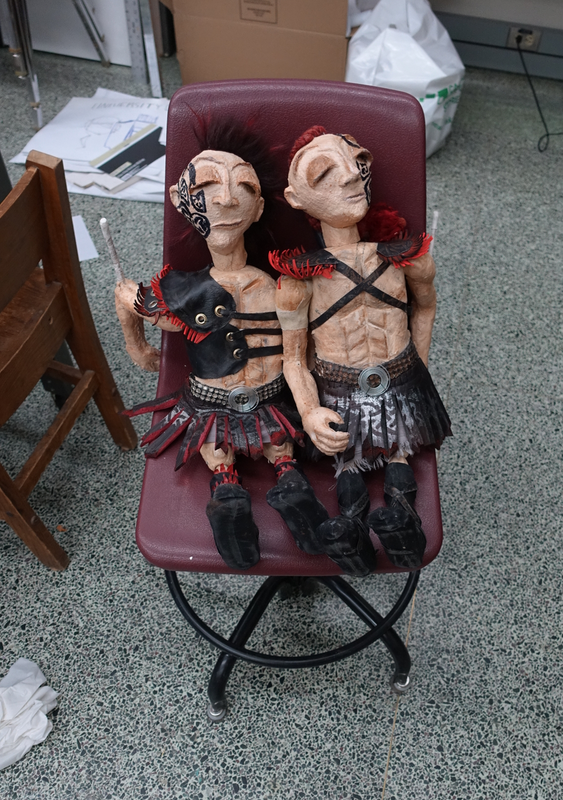 Turns out they were making all of the 44 puppets for this summer’s production of TITUS A. Puppet Revenge, July 12 to August 19th. Backstory: TITUS A. Puppet Revenge will tell the story of the most violent and bloody tragedy ever performed at the Shakespeare on the Saskatchewan festival. Dismemberment, disembowelment and cannibalism will all play out with an amazing set of carefully crafted rod puppets in a small tent tucked into a corner of the site. It is billed as a delightfully disturbing romp for mature audiences. Due to the detailed nature of puppets, I recommend attendees bring opera glasses or binoculars. Turns out we were welcomed by Kristi Friday of Stumped Productions who along with some hired hands were building all of the puppets. After looking around and chatting a bit, she asked if we wanted to come with her to the basement where they had set up a small rehearsal stage to test out the puppets and we could see the finished puppets. We said “Hell Yes!” It was fun to get a behind the scene tour and an up close and personal look at the puppets. Puppets in various stages of completion. An up close and personal view of the inner workings of the puppets. The handmade puppet are glued, stitched and clamped together. Next door to the rehearsal stage, was the basement room that attracted us to go inside the building in the first place. Here we were rewarded with the opportunity to see some of the fun stage costumes other production from bubble wrap dresses to vintage hat boxes. It was like finding a buried treasure or an unknown museum. #1 Always travel with your eyes and mind wide open. #2 Always leave extra time to explore unexpected opportunities. Calgary's 2018 Festival Fun For Everyone! 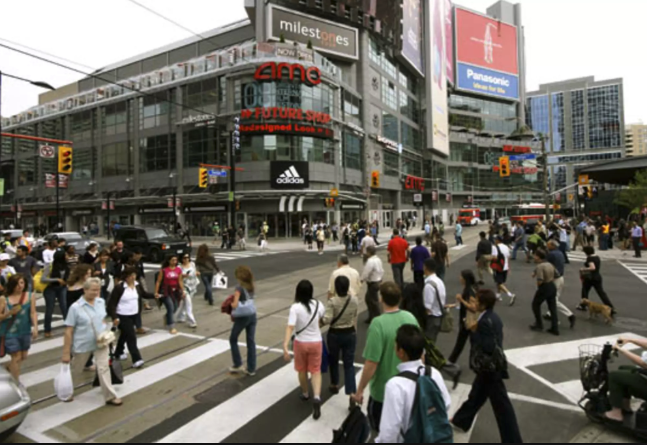 Cities are often defined by their signature festivals - Edinburgh and Edmonton by their Fringe Festivals, Montreal by its Jazz and Comedy Festivals, New Orleans by Mardi Gras, Quebec City by Winter Carnival and Rio de Janerio by Carnival. 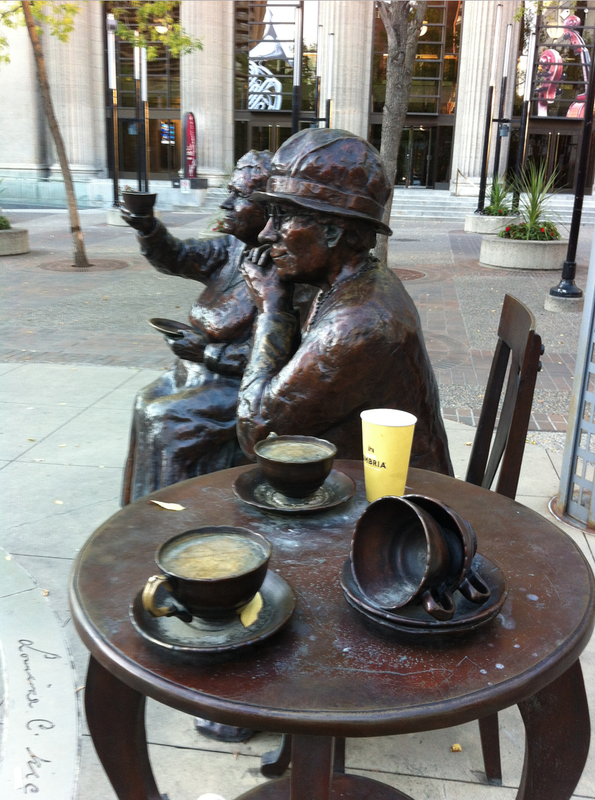 Similarly, Calgary is known internationally as the Stampede City, the result of the 100+ year old Calgary Stampede. 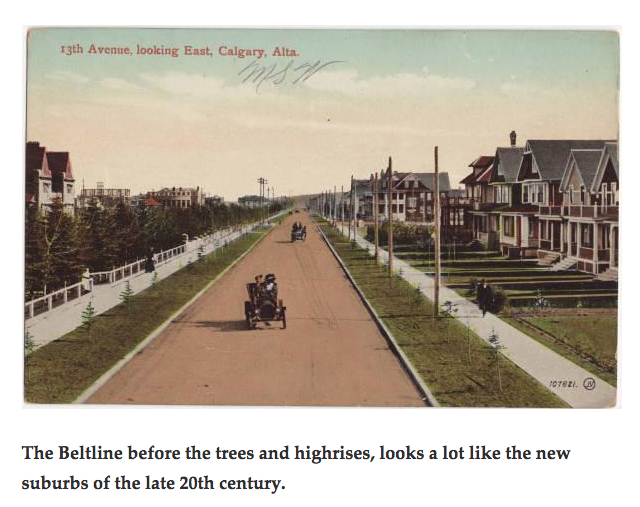 However, over the past few decades Calgary has become more than just the Stampede. 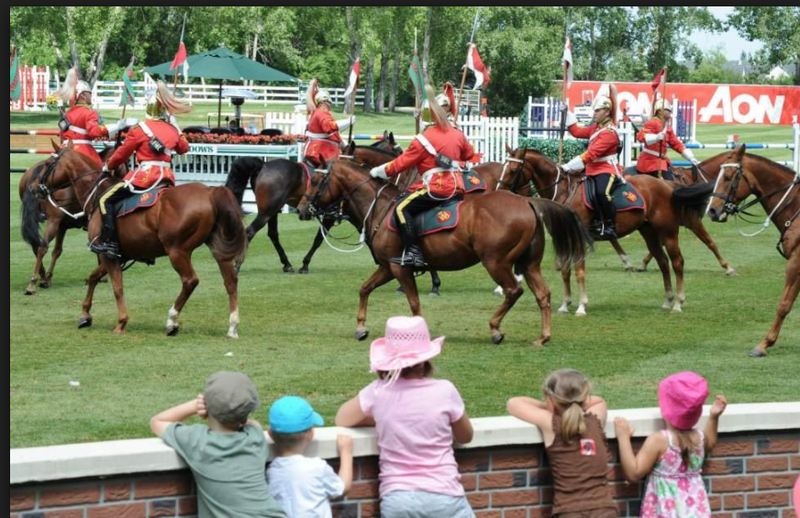 Spruce Meadows has made Calgary the show jumping capital of North America. 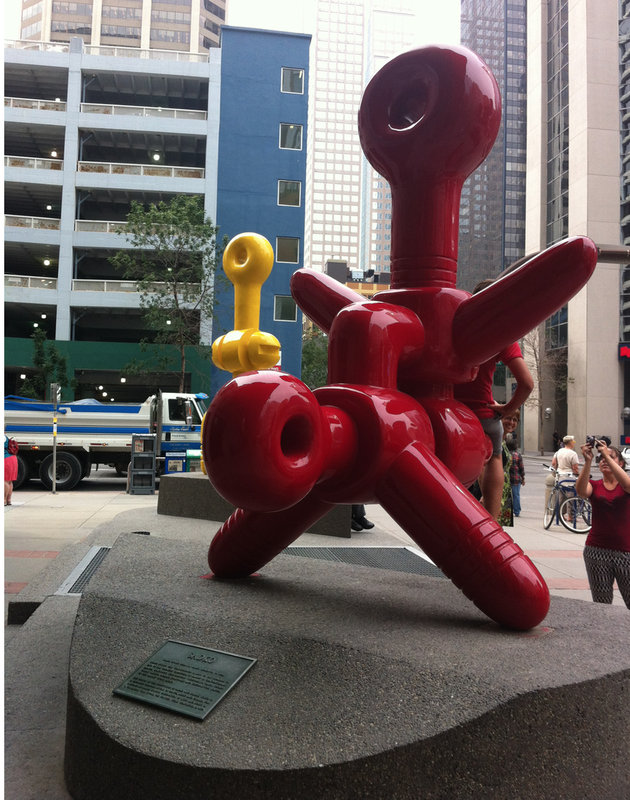 Beakerhead celebrates Calgary’s emergence as an international engineering and science hub. And SLED Island reflects Calgary’s evolution as a budding new music city. For anyone considering a visit Calgary in 2018, here is the line-up the City’s major festivals - something for almost everyone! In 1987, Calgary’s One Yellow Rabbit collective of artists produced the “Secret Elevator Experimental Performance Festival,” renamed the following year as the “High Performance Rodeo.” Over the past 30+ years it has evolved into one of North America’s best contemporary art festivals, featuring local and international theatre, music, dance and visual arts, a true multidisciplinary celebration of the arts. This year it offers up 23 sizzling shows, 153 performances at 15 different venues. Friends highly recommend the 10-minute play festival, they have attended every year for the past 20+ years. Foodies won’t want to miss the Big Taste where 80+ restaurants in City Centre offer special 3-course fix price menus for lunch and dinner. There is even a Gourmet Big Taste 5-course dinner for $65. The Big Taste is Canada’s oldest restaurant festival and offers a chance to experience Calgary’s contemporary dining scene – Cotto, Pad Thai, Foreign Concept, Yellow Door, Pigeonhole, Bar Vonder Fels, Charbar, Model Milk, need I go on. In 1931, a small group of Calgary musicians created The Calgary Music Festival held at the Knox United Church. By 1954, the festival was so large the organizers asked the Kiwanis Clubs of Calgary to take ownership of the Festival, and became the Calgary Kiwanis Festival. It continued to evolve into one of the largest amateur competitive music festivals in North America by the end of the 20th century. 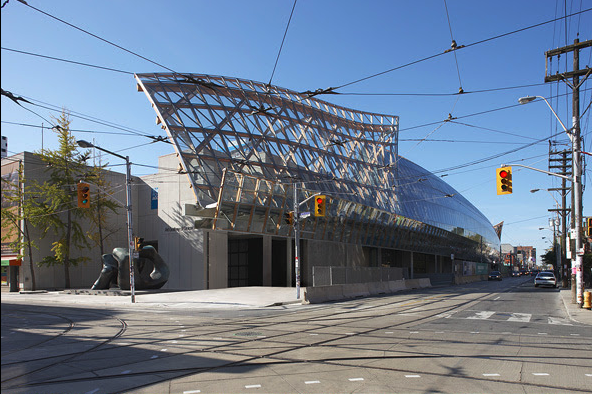 In 2014, the festival included theatre, resulting in another name change - The Calgary Performing Arts Festival. Today, the Festival has over 4,000 entries and 12,000 participants performing in the new Taylor Centre for Performing Arts Centre at Mount Royal University. Calgary Expo is a four-day mash-up of comics, sci-fi, gaming and cosplay fun for all ages. 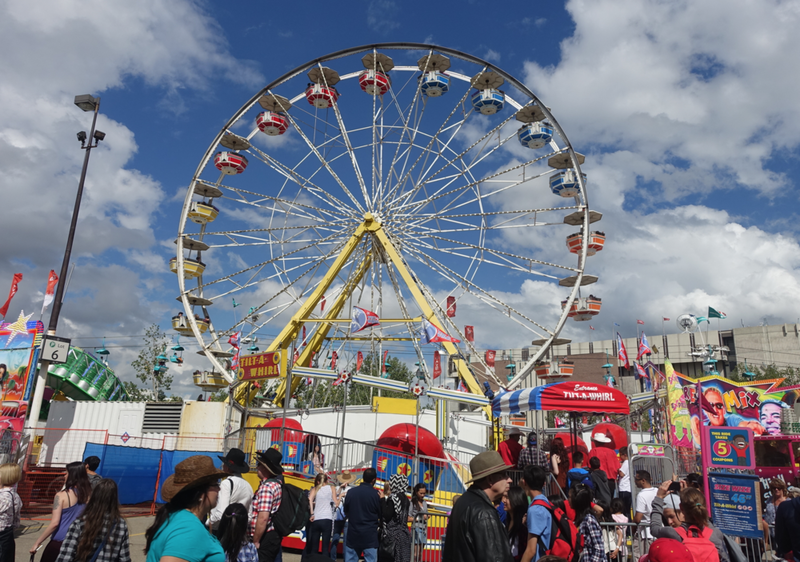 In addition to headliners, hundreds of vendors, workshops and talks and costumes transform Calgary’s Stampede Park into a colourful fantasyland for over 100,000 visitors. Don’t miss the parade on the Friday - everyone can participate as long as you dress-up! 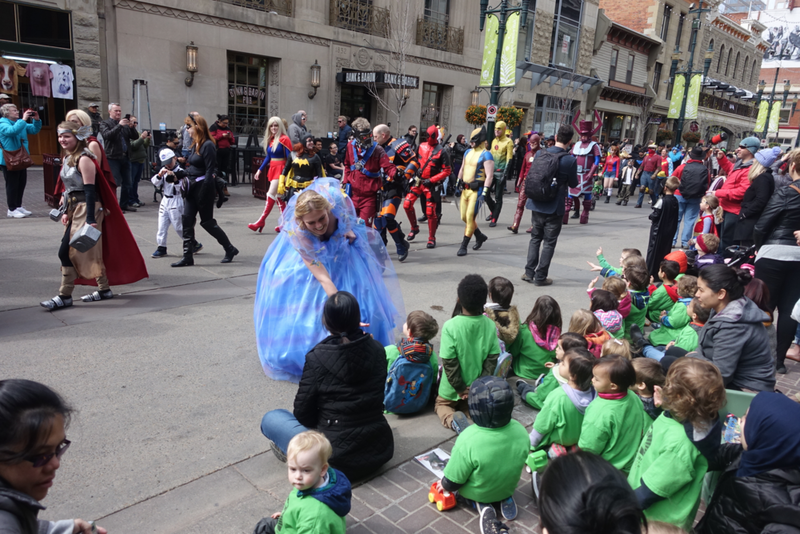 Everyone loves a parade, especially one's with princesses and super heroes! Established in 1987, the Calgary International Children’s Festival has grown to become Canada’s second largest Children’s Festival. Each year it not only transforms the four theatres and concert hall of Arts Commons into a giant children’s playground, but the surrounding Olympic Plaza as well. A wonderful festival for the young and the young at heart. 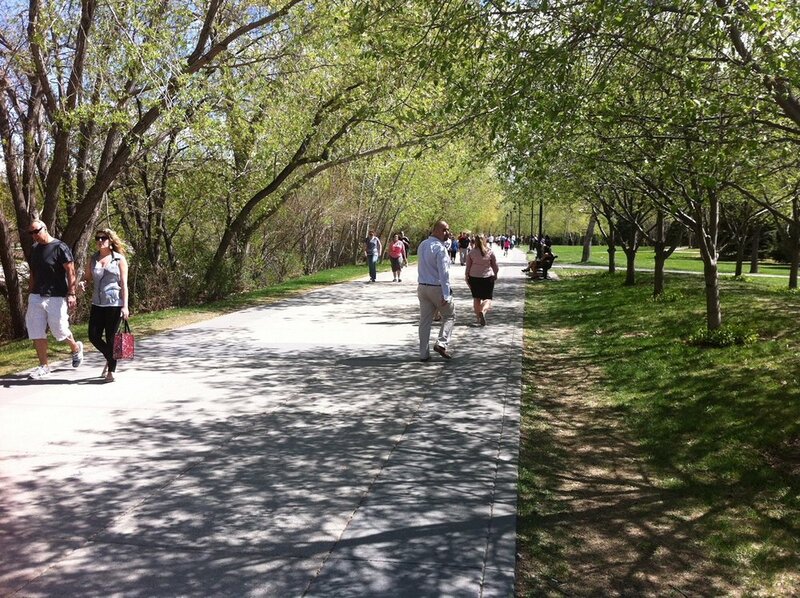 Join 100,000+ Calgary in celebrating the arrival of spring at the 4th Street Lilac Festival. The street comes alive with six stages and 500 vendors creating Calgary’s best street party along 4th Street SW from the Elbow River to 17th Avenue SW.
Sled Island Music & Arts Festival is a curated mash-up of music genres and art with more than 250 events at 35 different venues (record stores to Olympic Plaza) including bands, comedy, films and exhibitions involving local and international headliners and emerging artists. Billed as the “Greatest Outdoor Show On Earth,” the Calgary Stampede combines a 2-hour long parade attracting over 200,000+ people, as well as a Rodeo, Chuckwagon Races, Grandstand Show, Agricultural Exhibition, Midway, Indian Village and Music Festival (headliners have included Garth Brooks, Katy Perry, Keith Urban, Reba McEntire) that attracts over one million visitors of all ages and backgrounds to Stampede Park. Stampede is seven festivals in one - Agricultural Exhibition, Indian Village, Rodeo, Chuckwagon Races, Grandstand Show, Midway and Music Festival. No city can match the pastoral setting of Calgary International Folk Festival held at Prince’s Island Park located in the middle of the majestic Bow River and in the shadows of Calgary’s glittering downtown skyscrapers. It’s a magical place with glowing sunsets each night on the Main Stage headliners like Coeur De Pirate, Tanya Tagaq or Blue Rodeo in 2017. During the day, enjoy the six stages for an up close and personal experience under the canopy of 100-year old cottonwood trees. For history buffs, don’t miss the hundreds of lectures and walkabouts lead by local history enthusiasts organized by Chinook Country Historical Society. 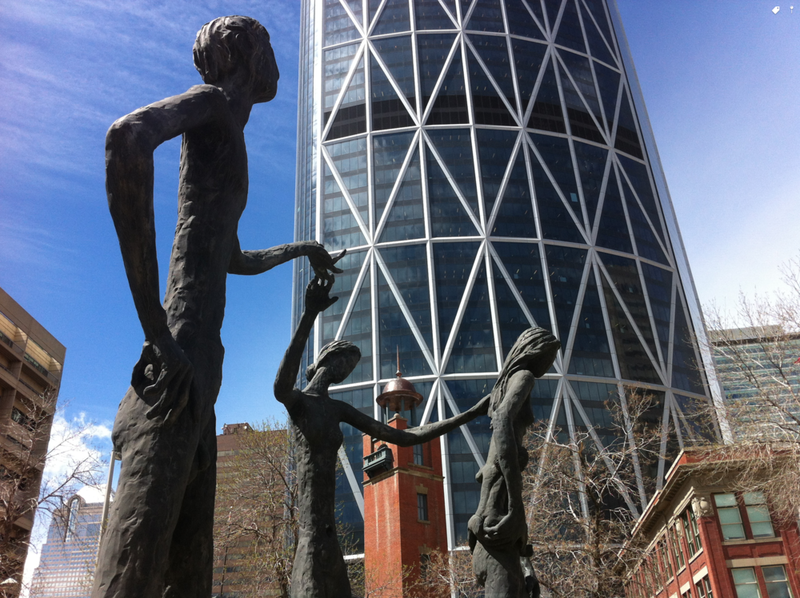 Learn all about Calgary’s boom/bust evolution from the Blackfoot nation’s summer meeting place, to the pioneer settlers, to becoming one of North America’s leading corporate headquarters cities. GlobalFest burst (pun intended) onto the scene in 2003, a collaborative effort that combines an international fireworks competition with a multicultural night market. Held in Calgary’s Elliston Park with its man-made lake, just off International Avenue (aka 17th Ave SE) it celebrates Calgary’s multiculturalism. The American Bus Association ranked it in the Top 100 Events in North America. Calgary is not only home to many world-class golf courses, but also to one of the premier PGA TOUR Champions events attracting one of the best international line-ups of the season. In 2017, the Shaw Classic had one of the largest audiences of any TOUR Champions event and set a TOUR Champions fundraising record of $8.3 million for local charities. It is a great opportunity to watch some of the greatest golfers of our time – Fred Couples loves this tournament! If you love classical music and the piano, don’t miss the Honens International Piano Competition. The quarterfinals are in Berlin and New York this spring, but the semifinals and finals are in Calgary. The winner gets $100,000 in cash and an artist development program valued at half a millions dollars – the largest of its kind. Beakerhead, perhaps one of the most unique festivals in the world, is a wonderfully bizarre combination of science, engineering and the arts. It encompasses 60+ events, installations and shows throughout the City Centre over five days and attracts over 125,000 participants. Bring the entire family - including grandma and grandpa. For the past 17 years, Calgary has hosted “the best little film festival on the prairies.” 0ver 200 films in multiple genres are screened over 12 days attracting 40,000 cineophiles. The Calgary Film Festival is recognized as one of the top “short film” festivals in the world. Over the past 22 years, Wordfest has showcased over 900 writers conducting readings, workshops, and panel discussions. Last year, 70 events attracted 15,000 people of all ages including children. Its year-round literary program culminates with this October festival featuring international best-sellers, groundbreakers and up-and-coming authors. At Christmas, 1.5 million lights transform the Calgary Zoo into a winter wonderland. It takes about 90 minutes to fully experience the displays. In addition, there is a mix of indoor (crafts, pictures with Santa) and outdoor activities (skating, fire pits) for all ages. The Spruce Meadows Christmas Market gives Calgarians a shopping experience filled with entertainment, delicious food, and unique gift buying opportunities. 300+ vendors spread Christmas Spirit in the indoor comfort of Spruce Meadows’ various buildings. Kids love Reindeer Alley, Candy Cane Lane and listening to various choirs, instrumental performances and magical dance displays amongst the 74 kilometres of Christmas lights strung around the grounds. (Seniors (65+) and Children (-12) admitted free. Each year the Lions Clubs of Calgary create a free Festival of Lights in Confederation Park incorporating over 450,000 bulbs on 16,000 strings into various Holiday characters. The festival is unique as you can enjoy it many different ways – drive-by on 14th St NW, walk, snowshoe, cross-country ski or even toboggan down the hills amongst the display. Lights are on from 6 pm to midnight, 7 days a week.